Dry at 135° for 3-12 hours on average. Time depends on how thin the fruit is sliced. You are looking for pliable but not damp, wet or overly sticky. On some fruits and berries, you will want to do a dip in lemon juice (mixed with water). This will prevent browning of the fruit. If the fruit browns after being cut, dip it. Rehydration is equal amounts water to product. Rhubarb is a perfect ‘lazy’ plant. Once it is established you can pretty much do nothing for it and it will come back every year. Spring is its time to shine – once it gets hot it goes to seed. Our cold spring (has winter ended? hah!) has been producing a great crop. I was out weeding and was thinking of ideas for using up the ample harvest. 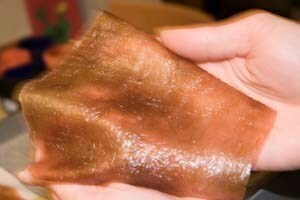 I hadn’t tried rhubarb leather so I thought…why not? 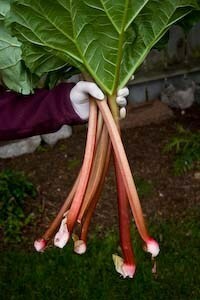 For harvesting the rhubarb, all you need to do is snap the stalks at the base or tug lightly – they will pop right off. For most people they will never see Rhubarb with leaves on – the leaf part is poisonous, so promptly go over to your yard waste bin and snap off the leaf part. I rinsed the Rhubarb well and let drip dry. Weighing it out I had about 2 lb. of trimmed stalks. I cut it up into small chunks (about 6-7 or so cups in volume). I placed the Rhubarb into a non-reactive large saucepan with 2 cups water and 1 cinnamon stick. Covered I brought it to a boil, then turned down to medium low heat and simmered for 15 minutes. At that point I took the lid off and cooked for another 30 or so minutes. This helps cook the water off so you have a thick applesauce like texture. For my personal taste I added in 1 cup white sugar and let simmer a bit more. Depending on how tart you like it, start with 1/2 cup sugar and add to taste. The Rhubarb will have fallen into thin shreds with no lumps. I lined the dehydrator trays with parchment paper (I used a rectangle shaped L’EQUIP dryer). Each tray was two servings. I poured 1/3 cup sauce onto each section. They were dried at 135° for about 9 hours. In the last couple hours once they were tacky (not wet) I flipped them over to get better exposure to the heat. Once dry (no wet spots, still soft in texture but dry) I let cool at room temperature. A couple hours later I came back and peeled the parchment paper off. 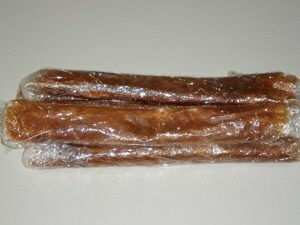 To make fruit rolls cut a piece of plastic wrap a bit bigger, lay the leather on it then lay the extra plastic over the edge then start rolling up like a cigar. This way the leather is touching plastic wrap and won’t stick. To preserve the shelf life store them in the refrigerator. Not that they will last long! They are delicious! Once sorted we washed and dried the apples. Then we squeezed a large lemon, strained the seeds and added it to a large mixing bowl, adding a couple of cups of water. Peel the apples one at a time, coring. Then slice into thick pieces, tossing into the lemon water as you work. Once done I drained the water off, shaking the apples off. Then I added about 3 Tablespoons golden syrup, which is a British sugar syrup. Granulated sugar would also work fine. Add in a teaspoon of cinnamon, gently stir to combine, let sit for a couple of minutes to marinate. 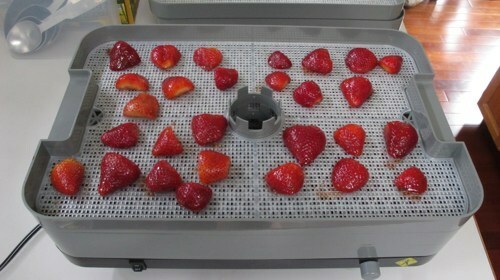 Line your dehydrator trays with mesh inserts if you have them. Either drain the apples or scoop with fingers and let drain before placing on the trays. Make sure none of the pieces are touching or on top each other. Dry at 135° till they break – they will still be soft though, not brittle. How many hours? It depends on thickness, apple variety and humidity. Mine took all day. Store in an airtight container. Due to the sugar content, check often and use up sooner than bare apples. On the lemon water – do use it. Apples darken quickly, this quick bath will stop nearly all of it. Store in tightly sealed containers, preferably glass (Mine are temporarily in a bag till I get more jars!). In the first week or so, shake the container daily so the fruit doesn’t stick together, this spreads any remaining moisture around. Wash the berries, shake dry. Remove the stems off the top, cut in half. 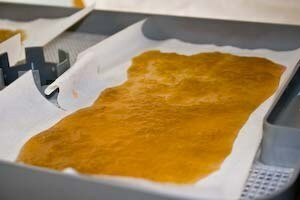 Toss the berries with the flavorings, distribute evenly, face down, on mesh lined trays. Set at 125-135° (or to your models recommendation). When the berries are mostly dry flip over (hooking a fingernail under the edge makes this easy) and finish drying. How long will it take? It depends on how big your berries are, how ripe they are and the humidity/temperature. Mine dried during a rainy period so they took 24 hours to dry. If you cut your berries thinner, say into 4 slices instead of 2 per berry they will dry much faster. Once dry store tightly sealed, if you see moisture on the wall of the container your berries were not dried long enough. Eat quickly to avoid spoilage. For long-term storage seal tightly and freeze. Drying pineapple is relatively simple. Scrub the pineapple, dry off and lop off the top and bottom. Remove the peel with a knife, trimming any of the “eyes”. Once that is done, cut the fruit off the core into 4 big pieces, then thinly slice as desired. Dry on mesh lined trays until dry, but flexible, at 135-145°. Make sure it is not tacky or wet. 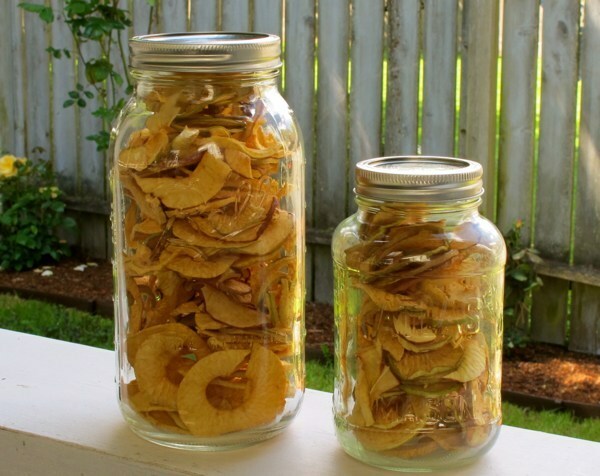 Let cool and then store in mason jars, shaking the jars periodically. Bananas are a great snack, they taste great and are also an excellent source of potassium (which help you feel good when hiking!). 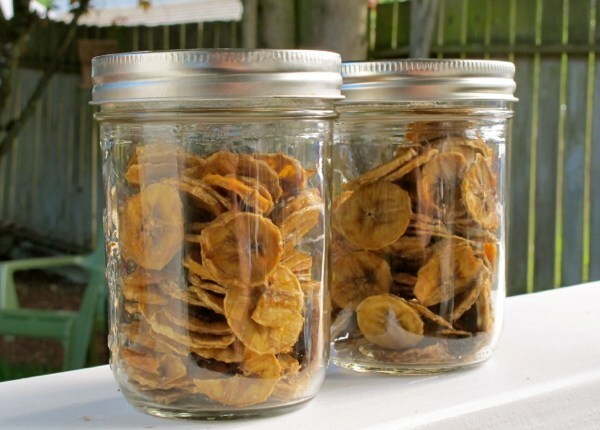 If you have a lot of ripe bananas, get to work. For an extra flavor boost, juice 2 oranges into a mixing bowl, then slice the bananas about the thickness of a quarter coin, into the orange juice. Let marinate for a few minutes, then place in single layers on the trays. Bananas will vary for time. I give mine 8 to 16 hours, it depends on humidity and also on just how ripe your fruit was. You want the slices to be flexible but not moist or sticky. 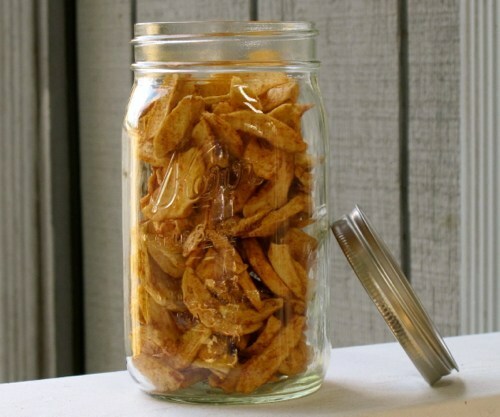 Once dried, let sit on the dehydrator until cooled, then store in an airtight container, such as mason jar. Periodically shake your containers to distribute the fruit. Fall can be a good time in cooler climates to pick up freshly harvested grapes from local growers. At the farmers market I picked up two types. The green ones were very tiny pearls, intensely flavored, an almost champagne flavor/aroma. They were seedless. The purple ones were seeded, still I wanted to see if it was any harder to dry them so I bought a pound to play with. Grapes do require a little work ahead but it is simple to do. After rinsing off the grapes and pulling off the stems I shook them dry. With the seeded ones, I split each grape in half and popped the seed(s) out with my pinkie nail. Then placed cut side down on mesh lined trays. These raisins took about 24 hours to dry at 135°. The golden raisins were more complex. While you can pierce each grape with a toothpick or skewer, I opted for the blanch method as it is faster. Bring a pot of water to boil, add the grapes and blanch for 30 seconds, scoop and drain, then on mesh lined trays. After letting them dry for 24 hours I went through the raisins, removing any that were dry. They will be pliable but not juicy inside. 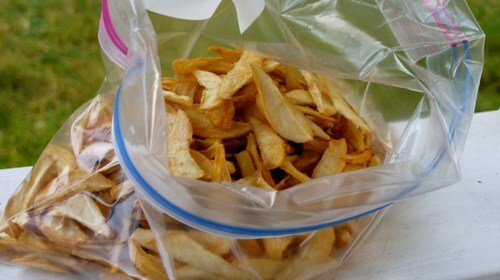 Remove the dry ones and set aside to cool. Overall it took about 36 hours for the biggest ones to dry. 1½ pounds doesn’t make a lot – they make up for it in how intense they taste. Do keep tightly sealed, in a cool and dark place for best storage. 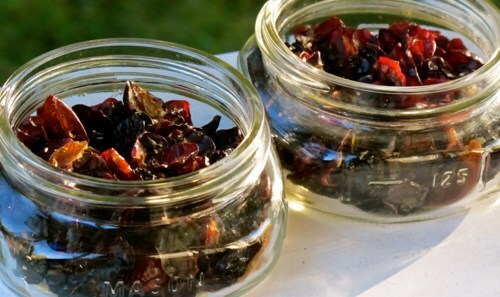 As with all dried fruit and berries, shake the jar daily the first week to distribute any moisture left. 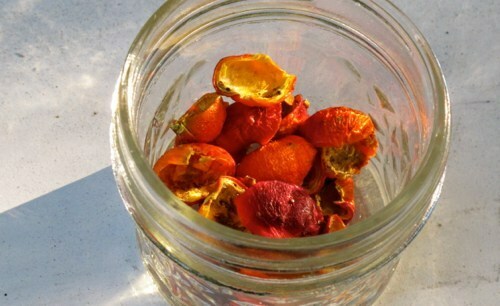 In modern times one might question the wisdom of dehydrating rose hips. It is easy to forget that they are truly a food, one rich in Vitamin C and also tastes great. Snappy, tart and simply wild. They make a lovely “herbal” tea in winter once dried and can be soaked fresh in handmade syrups or honey to make a syrup that is wonderful added to many things. Wild roses grow as freely as blackberries often, especially along coastal areas. With roses you do need to be careful, they MUST be grown organically or picked wild/feral from areas you know to be chemical free. Do NOT take rose hips or rose flowers from bushes that are sprayed with fertilizers or pesticides. Thankfully I have access to many a wild bush and know where to do some semi-urban foraging. Store them tightly sealed, in a dark and cool area of your home. To use for tea, add to any favorite tea or simply soak a few shells for 5 minutes in boiled water. The rose hips can also be ground for sprinkling on. You will need a heavy duty grinder, I have used my dry container of my Vitamix blender for this.